Sydney. Call Us for a FREE Quote! 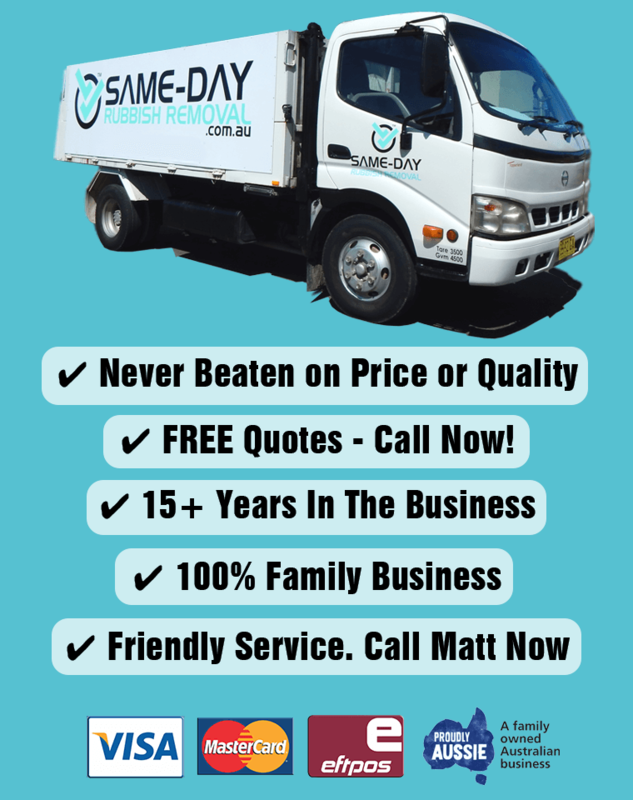 Call Same-Day Rubbish Removal Sydney. We'll have your junk gone in a flash, and at the lowest price. Remember the feeling you get when you first walk into a new home? The feeling of clean spaces and a blank canvas. Of order and cleanliness. Accumulating too much junk can really make life difficult, get in your way, and hold you back. Why not get on with your life, and let our friendly & experienced Same-Day Rubbish Removal team safely dispose of your junk? It's fast and easy. Call Matt now for a fast, obligation-free waste removal quote, and we'll have your rubbish removed in no time. Whether you are renovating your Sydney home, doing a little spring cleaning or simply buried under a pile of waste that you have accumulated over the years, now is a great time to contact Same-Day Rubbish Removal for assistance. We understand how stressful and even embarrassing it can be to have junk scattered around home, and we are the trusted company that you can turn to for a fast response. We are not the only junk removal service company serving Sydney, but we are the company that you can contact for reliable service for all waste removal needs. Many people will accumulate unused items over time at home and in the workplace, and you may not realize how much you have laying around until you do a little spring cleaning. Some will clean out their garage or will go through all of their cupboards in preparation for a big move into a new home. Still others will accumulate trash and debris when rennovating their property or even after a big outdoor yard clean-up or home improvement project. 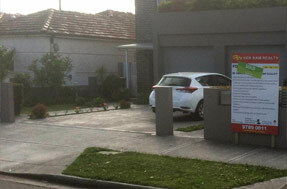 When curb side pick-up will not do the job, trust us to remove your rubbish for you, and take it away in our trucks. When you initially call, we can provide you with an estimate with our affordable fees. We can also schedule a time to pick up your items from your property. Our team will arrive as scheduled and will work diligently to load up all of the debris and to clear away the trash from your property. We strive to impress you with a job well-done, and after we leave, your rubbish issue will be a thing of the past. 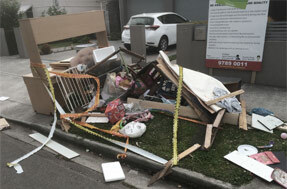 Accumulating waste is simply a part of life, but it can lead to a chaotic, unsightly mess on your property. When you need to find a fast solution that will result in the removal of your pile of junk, look no further than Same-Day Rubbish Removal Sydney. Call our friendly staff today to request an unbeatable quote and we’ll get the job done fast.